The sign on the door read Doctor Evan Reid and not a letter had changed since the day they were painted on the glass. Grace read the words for what had to be the hundredth time and took a steadying breath. If he told her to leave, then so be it, but the suspense was killing her. She nodded and clutched her reticule. “How was the trip?” His smile wavered. Evan was one of the most perceptive men she’d ever met and if the look on his face was any indication, he knew exactly what she wanted. The look on his face said he hadn’t. She hid her disappointment behind a weak smile. The tears she promised not to shed burned her eyes. She lowered her gaze and blinked them away. Not once has she begrudged a second of time Alex asked her to help out. Tending to Catherine and James was the highlight of her day most of the time, but leaving them and going home alone wasn’t the same as rocking one of your own to sleep and laying them down knowing they would always be there. As much as she loved her niece and nephew, it was different than loving one of her own. Every time she looked at them, the face of her own baby, delivered months too early, filled her mind’s eye, and every time it did, her heart broke even more. “But what?” Grace prompted when he stopped talking. She opened her mouth several times but never made a sound. A medicine man? Grace stood and paced away from the desk, stopping at the window. She moved the curtain aside, staring at the school for long minutes. She left and hurried down the sidewalk, ducking between the buildings and hurrying over to the bench nestled underneath the trees behind the mercantile. Countless days had been spent sitting there while her heart bled out what she thought was the last tear she had in her, but today proved she still had more. She hated feeling like this. Hated the pain that came with the wanting and cried until she felt hollow and the wind-chapped her cheeks nearly raw. Dabbing the wetness from her face, she inhaled deeply, composed herself, and stood. She’d been gone too long and Alex would wonder where she was. Catherine and James would never be hers but she could love them as if they were. They were family after all and apparently the closest she’d ever get to being a mother. The expression on her face told him something was wrong. Rafe took the horses reins and opened his mouth to ask what happened but Grace turned and headed to the house without a word. He saw to her horse, getting him bedded down for the night and finished his chores before heading inside. She was by the stove, her shoulders drooping. He hung his hat and crossed to where she stood. “Grace—” He didn’t get another word said before she turned, threw herself at him, and buried her face against his chest. “—Let me finish.” She sighed again and nodded her head, staring at his chest. “I love you and not having a baby will never change that.” His chest clenched when a single tear slid down her cheek. He brushed it away and leaned down, kissing her softly on the lips. He’d lost count of how many times she’d done this. Gone to Evan with some new hope of being a mother burning in her eyes only to return disappointed and heartbroken all over again. Helping with Jesse and Alex’s twins over the last several months hadn’t help matters either but he didn’t have the heart to tell her to stop. It might be time to talk with Jesse instead. If they told Grace they were fine, then maybe she’d stop going over there every day on her own. Doubtful, but it was worth a try. “What is it?” When she didn’t answer, he cupped her chin and brought her head back up. No, he didn’t, but he didn’t say as much out loud. She turned back to the stove and went into great detail about heading to Missoula to find this Indian. 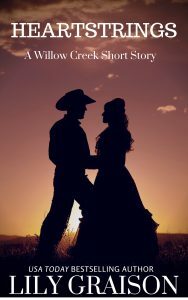 He let her talk, nodding when appropriate, and tried to think of a way to tell her visiting Indian territory wasn’t going to happen. She’d already lost three babies, one of which was big enough to see her tiny fingernails had already started to grow. The heartbreak those three failed pregnancies left behind wasn’t worth taking the risk again. He was losing the vibrant woman he married to one who was preoccupied and stressed and worrying herself into an early grave and he’d lost enough already. He wouldn’t lose her as well. Come morning, he’d talk to Jesse and put a stop to all this baby talk once and for all. HEARTSTRINGS releases on February 14th! Look for it at all ebook retailers.